Home theatre speakers are not as simple as stereo speakers to buy. A stereo speaker system consists of simply left and right speakers, but home theatre speaker systems can include anywhere from 4 to 8 or more speakers depending on the type of surround decoding you will be using. In addition to the regular or main left and right front speakers, there is also a center front speaker, two or more surrounds and two or more sub woofers. The front speakers are the most important speakers in a home theatre setup since they carry most of the sound you hear. 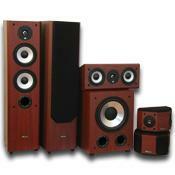 Center channel speakers are designed to reproduce movie dialogue and to anchor the sound to the screen. It is important that the center speaker does this with the utmost clarity and intelligibility because it is responsible for over 60% of the dialogue. The center channel should also blend tonally with the main front left and right speakers. Some home theatre speakers use a similar speaker for the center, left, right channels and, in some cases, the surround channel as well. This ensures that the tonal balance blends more seamlessly across the soundstage. Center channel speakers and some main speakers are normally shielded to prevent distorting the picture when placed close to a television. Rear channel or surround speakers are usually placed at the back or to the side of the room. Many manufacturers utilize a dipole or bi-pole configuration instead of the more conventional designs. Dipoles or bi-poles are designs that use drivers on opposite sides of the enclosure to produce a more diffuse and spacious rear soundstage. This is better for reproducing the ambiance found on some movie soundtracks.